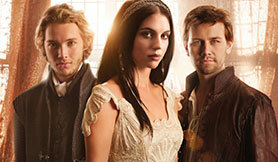 On Wednesday, The CW announced that the fourth season of Reign, which debuts on February 10, will be the last. The news is no real surprise given that the show’s ratings have been pretty modest since launch. Season three averaged 970,000 per episode, which puts it at the lower end of the channel’s typical ratings. An IMDB score of 7.6 also suggests it won’t be massively missed. For those unfamiliar with the show, Reign is a period drama that chronicles the rise of Mary, Queen of Scots in 16th century Europe. It is not overly concerned with historical accuracy and is generally viewed as a guilty pleasure. It is significant, however, in that it is part of a broad array of TV shows that have placed royalty at the heart of their stories. So this week, to mark the end of Reign, we’re looking at this sub-genre. The Crown Netflix is reckoned to have ploughed US$100m into this exploration of Queen Elizabeth II’s early life. Written by Peter Morgan and directed by Stephen Daldry, the show has received pretty much universal acclaim and is currently sitting pretty with an IMDb score of 9. A second season has been commissioned and the intention is that the series will run for five or six seasons (though Morgan has not yet committed to such a lengthy run). 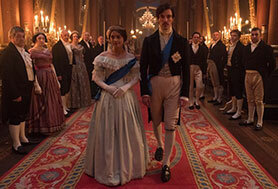 Victoria Vying with The Crown as the best royal series of the year is ITV’s Victoria. 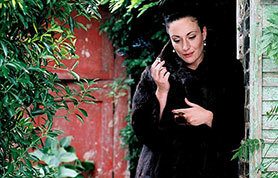 Written by Daisy Goodwin, the show has a similar blueprint to The Crown. Starting with the early life of the famous 19th British monarch, the show is intended to follow her through her life, with season two already commissioned. The show did well in the UK ratings, with an average audience of seven to eight million on Sunday evenings. It has also sold well internationally, although it’s too early to tell how the global market is responding to the show. It will premiere on PBS in the US on January 15. Its IMDb score is 8.3. The Tudors Michael Hirst’s epic series for Showtime helped kick-start the global trade in lavish, semi-fictionalised TV series about monarchy, power, aristocracy and the like. Aired for four seasons between 2007 and 2010, episodes of the show typically attracted an audience of around 700,000-900,000 for the US cable network. 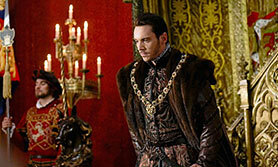 US cable channel Ovation recently acquired all four seasons of The Tudors to accompany its investment in Versailles (below). Note: other series to have explored the Tudor period include the BBC’s excellent Wolf Hall and ITV’s 2003 miniseries Henry VIII. The Tudors achieved an IMDb score of 8.1, Wolf Hall 8.2. Versailles Set during the reign of Louis XIV of France, this Canal+ drama rated well at home and has sold widely around the world. A second season is on its way and a third has already been commissioned, with production due to start in April 2017. The first season rated pretty well on BBC2 in the UK and has been renewed. In the US, it aired on arts channel Ovation – which scored its highest ever ratings when it aired the first two episodes back to back (a combined total audience of 557,000). Dubbed by one critic as the music video version of French history, the show hasn’t achieved the same critical acclaim as The Crown or Victoria, but it is praised for its high production values. The show, which ran for 139 episodes between 2011 and 2014, is based on the life of Ottoman Sultan Suleyman the Magnificent. It was followed by Magnificent Century: Kosem, which jumps forward four decades to tell the story of a female ruler who began her life as a slave girl. This show, also produced by Savci, has sold well internationally. Season one of Kosem aired on Star and season two on Fox. The Royals E! Entertainment’s The Royals is currently into its third season with an audience in the 600,000 range. This after the show averaged one million-plus for season one and around 750,000 for season two. 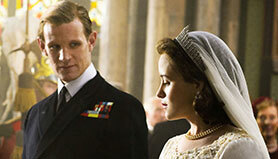 The show is a novel take on the notion of royalty, since it is based around a fictional British royal family. Elizabeth Hurley plays Queen Helena, a matriarchal figure attempting to maintain the family’s public image while dealing with a range of domestic problems. One of the key plot lines sees her son, Prince Liam, unexpectedly become first in line to the throne after his older brother dies. IMDb gives the show a 7.4 rating. Mary: The Making of a Princess The Brits aren’t the only ones with a royal family, of course. In 2015, Network Ten in Australia ran a TV movie about Mary Donaldson, a young Australian woman who married into the Danish royal family after a chance meeting at the 2000 Sydney Olympic Games. The show, produced by FremantleMedia, got a meagre 6.1 rating on IMDb and mixed reviews, but actually rated well with around a million viewers. Maximilian and Marie de Bourgogne: Historical royal dramas are popular for a few reasons. One is that they are less politically sensitive than stories about current royals. Another is that it is easier to fictionalise a dead royal’s life than a living one’s. And not to be overlooked is the fact that there are more royal families to work with, since a few of them have ceased to exist. In this lavish production, for example, the focus is on the love story between the son of Frederick III and the daughter of the Duke Of Burgundy in the 1400s. Budgeted at around €16m (US$17m), it is a coproduction between MR Film, Beta Film, ORF and ZDF. The Queen’s Sister As Mark Lawson observed in an article in UK newspaper The Guardian last year, TV producers tend to take a slightly deferential look at recent royals, saving the controversy for long-dead monarchs (notably Henry VIII). One slight exception to this rule is the Queen’s late sister Margaret, who is generally portrayed in the media as something of a hedonist. In 2006, Channel 4 told her story in a biopic entitled The Queen’s Sister, with Lucy Cohu as Margaret. Critics were divided over the show, some calling it satirical, others tawdry. It secured a number of Bafta nomination and aired on BBC America. See Lawson’s article here. Charles II: The Power and The Passion A good example of how historic royals are fair game, this BBC production looks at the feckless and lazy side of this 17th century British monarch, restored to the throne after the death of his father’s nemesis Oliver Cromwell. Written by Adrian Hodges and starring Rufus Sewell, the show does make an attempt to be historically accurate, relying to some extent on Antonia Fraser’s book Charles II. The show aired in the US and was nominated for a Primetime Emmy. IMDb gives it a rating of 7.6.